The rabbit was very weak, he couldn't even stand up not to mention he was very light like I can pick him up with 1 hand only. I let him rest and when I came home I found him dead and there were lots of poops. When I picked him up I noticed that the side of his body leaning on the floor was wet. I have no idea what happened since the other 2 rabbits are fine. And by the way this happened before when I bought a rabbit and 2 weeks after I found him dead. I never used the cage again. So I have no idea what happened. So sorry to hear about your rabbit. It is very hard to diagnose the problem from way over here, can you take the dead rabbit to a vet to obtain a necropsy (animal autopsy)? This would be your best way to get definitive answers. Nevertheless, I can offer you some sort of opinion based only on what you have told me – take it as opinion since I’m not a vet. I have several suspicions, and all are related to your statement that you feed grass for fiber: First, is the grass you give the rabbits sprayed with pesticides and therefore toxic or poisonous? Second, are there noxious/poisonous weeds in the grass? And third, is the grass contaminated with parasites such as Eimeria species that cause coccidiosis? Do local wildlife have access to this grass and could they possibly defecate in it, introducing various parasites? Your buck, being very light, had probably gone off his feed for perhaps a week or more. And since there were three in the cage, you may not have realized that 2 animals had great appetites but that third one was not eating until it got very weak. Some coccidia strains are quite deadly – they cause damage to the rabbit’s intestines, it develops enteritis (inflammation in the guts), the rabbit goes off feed and loses weight, and then it dies. Coccidia sometimes causes a massive and fatal diarrhea, but sometimes all you see is steady weight loss to the point of death. The wetness under the rabbit could have been diarrhea, but since you mentioned lots of poops, a better guess is it was leakage of urine that occurred after death. The fact that one of the three rabbits got sick and not the others needs to be explored. Now that there are just two in the cage, will these also begin to lose weight or go off feed? Keep an eye on them as you try to figure things out. If the problem is parasites, you'd think these two might also get sick, unless their immune systems are very strong. If the problem was a deadly weed, there is a chance that the other two escaped the problem this time, but that one of them might get sick and die if more noxious plants are gathered in with the grass. What else do you feed the rabbits? Do they receive sufficient nutrition in the form of pellets? Inadequate nutrition will weaken the rabbit’s immune system and leave it vulnerable to various health challenges. Maybe there is some other clue we need to know that will pinpoint the problem. I’ll be interested to know what you think of these thoughts, and in feedback from other rabbit breeders. Good luck! I have lost over 30 rabbits in 3 months. Most maybe 20 died as young adults losing one eye or both with no blood, scar, etc. One day they are well next day one, two or three are dead. The adults also died single, double or triple but none without eyes. Thought it was a predator but all died in night, I increased security they still died and healthy looking they died. I have lost newly born, teens and adults. Vet Doctors have no idea. In total maybe 80 rabbits have died this year. I thought it was weather increased warmth they just died. Gave medicine did not stop death. But those that died without eyes are a mystery...no blood. Some one help. Sounds to me like a nocturnal predator, despite your increased security. Setting up trail cameras might help identify the threat, and then you will know better how to protect against it. Other than predation, I have NO IDEA how a rabbit would lose an eye and then die. Best of luck figuring out the problem and stopping the losses! I had a baby bunny, he was healthy, eating drinking, fine, I heard him make a noise so I checked on him and he was on his side breathing or trying to and shaking. My mom tried to help but it didn't work. I don't know why this happened but please help me, I just lost him today on Monday, March 21, but please help me, i miss my baby so much. Sorry for the death of your bunny. The only way to know for sure why the bunny died is to take it to the vet for a necropsy (animal autopsy). Give yourself permission to get another bunny. 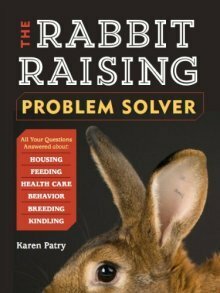 It might help to read through this website, especially the pages about feeding rabbits, and the pages about caring for pet rabbits.